With their latest eReader, Barnes and Noble have dropped the carbon-colored shell for an off-white rubberized trim around its border. Although it shares the same shape as its predecessor, the Nook Simple Touch with Glowlight, it comes in at a lighter 6.2 oz (compared to 6.95 oz). The back of the device is white and features a nice soft-to-the-touch finish and it also has a rubber insulator around the side of the device. The new rubberized finished feels good in the hands, doesn’t leave finger prints like the earlier model and most importantly B & N claims that it protects the Nook from any damage when dropped (there is a good drop test video that shows this). 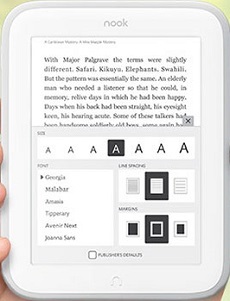 The new Glowlight (like most eReaders now) has done away with the physical page turn buttons of the previous model, but has kept the “n” shaped home button on the front of the device. Other changes have been the large power button on the back of the device has been moved to a more convenient side position with a USB connector and status along the bottom. One of the big changes on this device is the lack of expanded memory. The old device had a micro SD slot, but this time around it has been dropped. They have however doubled the amount storage from 2 GB to 4 GB (2.5 GB available for storage) which should be enough space for around 2000 books. The new model is also slightly thinner with dimensions of 6.5 x 5.0 x 0.42. The Nook Glowlight features the newest the newest Pearl eInk screen with an upgraded resolution of 1024 x 758 and 212 ppi which is the same as the Kindle Paperwhite 2, but not quite as good as the Kobo Aura HD. The text on the Glowlight is sharper than its predecessor and on a par with that of the Paperwhite 2. I would say that after extensive testing I found the touch screen although an improvement over the older Nook Simple Touch with Glowlight and still very good is not quite as responsive as that of the Paperwhite 2. The built-in front-light is a big improvement over the previous Nook. It is brighter, whiter and more even across the screen. It compares very well with the Kindle Paperwhite 2 as well. In fact it is brighter, just as white, although testing the devices side-by-side I did find the Paperwhite had a slightly more even spread across the screen. The Glowlight is running Android version 2.1. Firing up the device you are faced with a much simpler and less clustered home screen. The screen is spilt in half and along the top there are the books you have read recently and along the bottom books that are available to purchase on the Nook. You can swipe across the screen to see more or select See All. Along the bottom of the screen is 3 options: My Library, Shop and Search. Selecting My Library gives a grid type view of all your books with thumbnails and you can also change the view to a list view with just the names of your books. You also have options to sort your library by Books, Newsstand, Shelves, My Files, Archives or Anything Else. Finally you can sort the layout your whole Library by Title or Author. 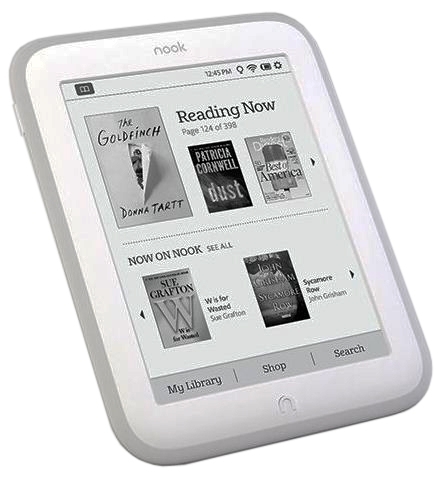 The Shop option connects you to the Nook Store and the Search facility allows you to search the device for books, magazines, files or anything else you have on there. Moving on to probably the most important feature, how does the Glowlight handle reading eBooks? Like the previous model (and most eReaders these days) page turns are performed by swiping right on the touch screen to go forward or left to go back or by just tapping on the right of the screen to go forward or on the left to go back. The first thing you notice on this is the lack of a screen refresh. On the old model every 1 – 6 pages (how ever you configured it in the settings) you would get a refresh which meant the screen turned black for a second or so and then showed the next page. You now get none of that and all the pages just turn very quickly. While reading if you hold down on a word brings up a menu along the bottom allowing you to Highlight the word or phrase, Add Note, Share which allows you to share a word, phrase etc and post it to your Facebook wall, to Twitter or to Google and finally have have the Look Up function which is basically a dictionary. Clicking in the middle of the screen brings up another menu along the bottom. You get options for: Content, Find, Go To, Text and More. The Text option allows you to change the size, font, line spacing and margins with all changes being done dynamically. The text when reading eBooks is very crisp and sharp and pictures and graphics when reading magazines is pretty good as well – easily on a par with the Kindle Paperwhite 2. I will say the Paperwhite’s background is a little bit whiter than the Glowlight’s however. Moving onto PDFs is a bit of a mixed bag. On the plus side PDFs load very quickly and the device can easily handle very large PDFs without an issue. Page turns are also very quick. This is in comparison to the Paperwhite which seemed to struggle loading large PDFs. Where the Paperwhite has a distinct advantage is that it is possible to pinch and zoom on the Paperwhite. This is useful when in full screen mode as PDFs with diagrams and pictures look small on six inch eReaders and being able to zoom in on them is very useful. You also know where you on the page when you have the ability to pinch and zoom. This isn’t possible on the Glowlight and the only way around this is to enter the reflow mode. Basically this is when you change the size of the font to make it larger so you can see all the information on the PDF. However this often strips the PDF of the diagrams and also makes it hard to know where you are on the page. Another disadvantage is that you can highlight, make notes or look up anything in PDFs like you can on the Paperwhite. I would have to give the advantage to the Kindle Paperwhite 2 when it comes to reading PDFs, although the industry leader as far as reading PDFs is still the Kobo Aura HD. Finally, in case anyone was wondering if they have a web browser or not, they do kind of. While you won’t find it in the settings there is a way of browsing the web. You need to swipe down and select All Settings, select Social, select Link to Facebook, twitter and Google, then link to Google, select Need help and then finally select Google Home at the bottom of the screen and hey presto you are on the Google home page and you can start surfing. Pretty long winded to access and the browser isn’t that great anyway, but some people like to browse on their eReader so that’s the way to do it. The battery life on the Glowlight is 2 months (based on 30 minutes of reading per day with the wireless turned off) which is the same as the previous model and indeed the same as the Kindle Paperwhite 2, Kobo Aura & Aura HD. Memory this time has been doubled to 4 GB with 2.5 GB reserved for content. This is the same as the Kobo Aura and Kobo Aura HD and double that of the Kindle Paperwhite. As mentioned earlier this time around they have dropped the Micro SD slot, so you can’t expand the memory. Saying that, the memory is enough to hold 2000 books which is more than enough for most people, plus you also get cloud storage to store your eBooks on. The Nook Glowlight is a WiFi only device and you can get free WiFi at all Barnes & Noble stores as well as 30,000 AT&T hotspots for starters plus anywhere else that has free WiFi. You can also store all purchases on their cloud infrastructure. 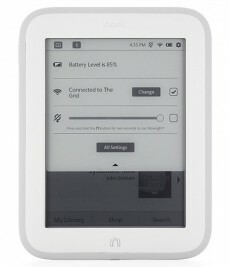 The Nook Glowlight retails for $119 which is the same as the Kindle Paperwhite 2 (ad version). This is cheaper than the Kobo Aura, Aura HD or Glo and cheaper than the ad free Paperwhite 2. Looking online Barnes & Noble, Target and most of the leading retailers sell it for $119, with Amazon just slightly cheaper at $117.95. The new Nook Glowlight is a big improvement on it’s predecessor, the Nook Simple Touch with Glowlight. The light is brighter, more uniform and much whiter. Reading is also much improved with a higher resolution screen and crisper text. The fact they have completely done away with the full page refresh during reading also makes it a much more enjoyable experience. The design is also better in terms of handling it and the protection it gives. The dropping of the Micro SD slot will be an issue for some as it is now not possible to expand the memory, but on the plus side the meeory has been doubled from 2 GB to 4GB. So how does it compare to it’s nearest rivals. Comparing the displays on the Glowlight to the Paperwhite 2, I found very little difference. Both screens have the same resolution and the text was equally crisp on both despite the Paperwhite 2 having the newer Carta screen compared to the Pearl of Glowlight. The Kobo Aura HD is still the best when it comes to screen resolution and crispness of text. The front-light again is good on both, with the Glowlight slightly brighter, but the Paperwhite’s light slightly more even. Where the Paperwhite (and Kobo Aura & Aura HD) pull ahead is the way they handle PDFs and the amount of software features they have especially the feature laden Paperwhite. If however you are just interested in reading eBooks and don’t mind about losing some of the features you won’t go far wrong with the Nook Glowlight, plus it is cheaper than the Kobo Aura HD, Kobo Aura and the ad-free Paperwhite 2.